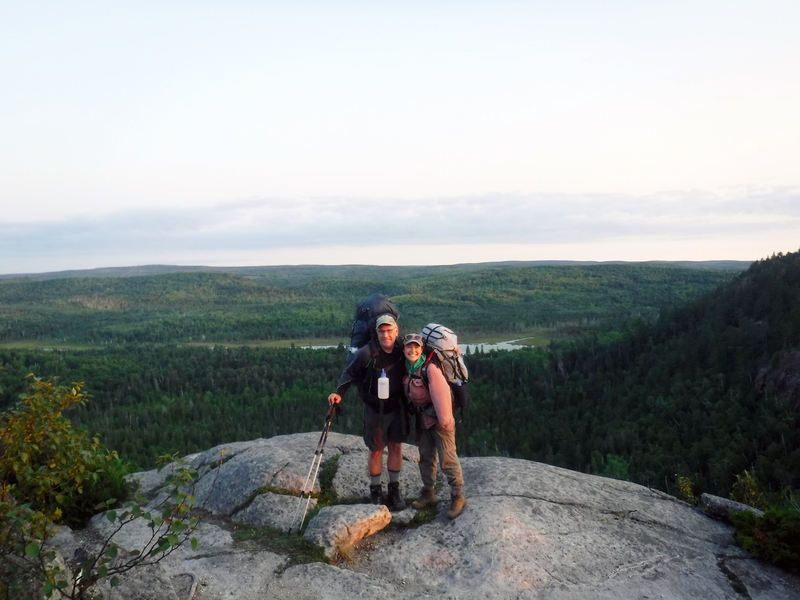 Mark Petraitis and Emily Roskey are part of our team here at Voyageur Outward Bound School (VOBS). This summer, they had a chance to work together for the first time. Together, they led one of five crews for The Fellowship Initiative (TFI) Expedition that went on course with us this August. TFI is an innovative, multi-year character and leadership program that serves young men of color in Chicago, New York, Los Angeles and Dallas. 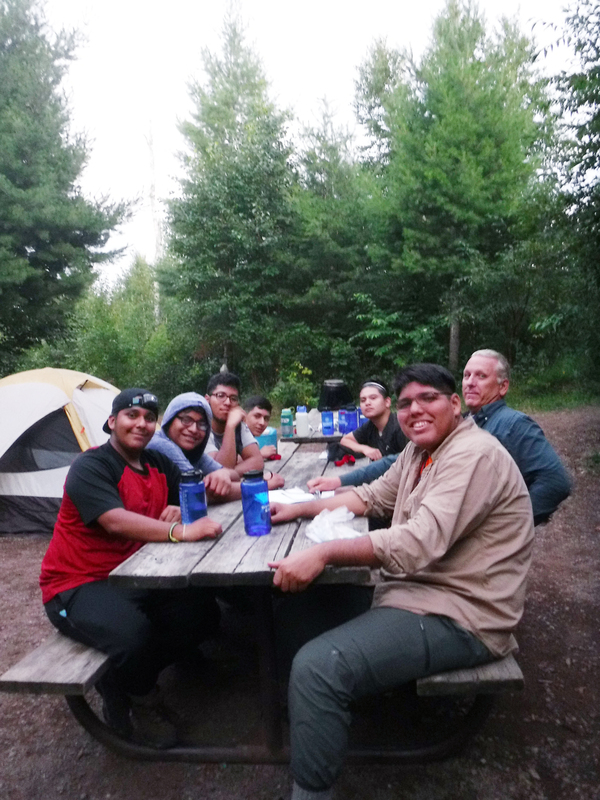 Thanks to JP Morgan Chase, Outward Bound serves the men of TFI with wilderness leadership expeditions each summer. 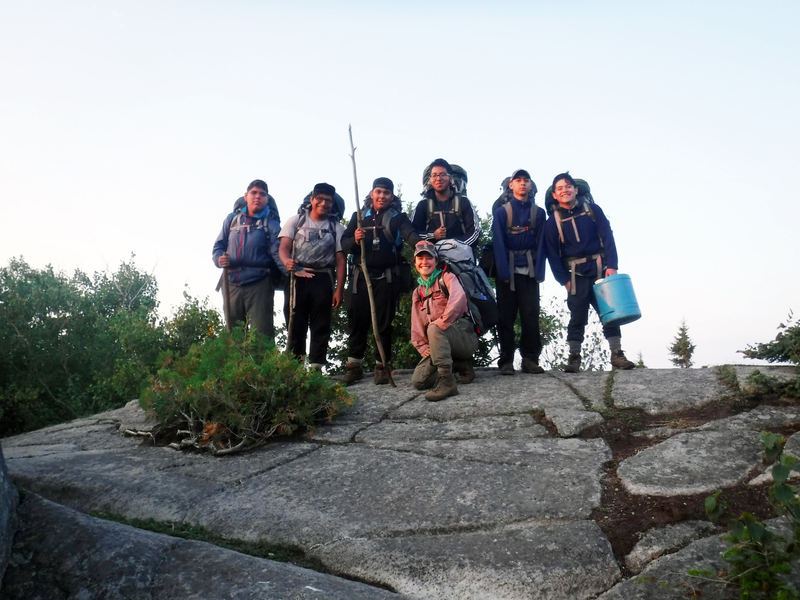 This year, Voyageur took Chicago TFI students out for a Superior Hiking Trail Backpacking course. We are very proud of our partnership with TFI and feel extremely privileged to work with this ambitious and dedicated brotherhood of young men. Where did Outward Bound start for you? Mark: Well, during my “younger years,” I worked for Outward Bound (OB). From 1975 to 1985, I witnessed firsthand how Outward Bound programs do many great life-changing things for various populations. I actually used OB teaching practices/philosophy throughout my subsequent corporate career. Now, after 30 years on the greatest “expedition” of all — raising my own family — I’ve come back to Outward Bound. Emily: I worked in urban education, specifically college access for first generation students from educationally underserved communities. The students inspired me, but I felt conflicted about the idea that college preparation was their only pathway. 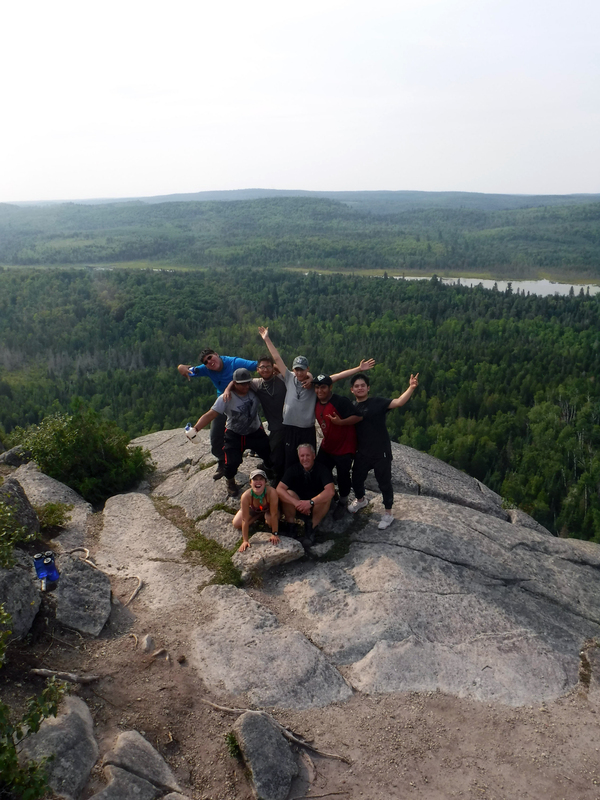 I decided to try working in experiential education where the wilderness is the classroom. Now I help young people find themselves, solidify their values and develop compassion for others — basically, I help people learn how to be better people. This type of education is great preparation for college and any other life goals. What do you love most about being an Instructor? Emily: I love being able to witness human experience through a holistic and comprehensive lens. I journey with students through their ups and downs — both real and metaphorical storms and sunshine. I’m constantly reminded of the complexity and diversity of human behavior and personality. The dynamic nature of expedition life illuminates the ways people change, learn and grow. Without phones or doors to close, you can’t hide your true self very easily. I think our experiences in nature are immensely healing and transformational for people, especially young people, who might be coping with challenges like judgement, or even violence. Mark: I love the people I work with, but I also love the natural, inspirational beauty of the mountains, lakes and rivers that I get to call my office. The magic of the environment is a powerful main ingredient of every VOBS course. Nature helps us facilitate challenging but safe learning for our students as they venture outside their comfort zones. What’s the most challenging thing about being an instructor? Mark: At this point in my life, one of the most challenging things about being a dynamic VOBS instructor is maintaining my self-imposed stamina & grit requirements to run a bang-up, slam-dunk, rock solid course. I expect every course that I’m involved in to meet each student where they are and also to stretch their comfort zones. I think this is how real growth and learning take place; to facilitate these expeditions requires enormous amounts of energy! 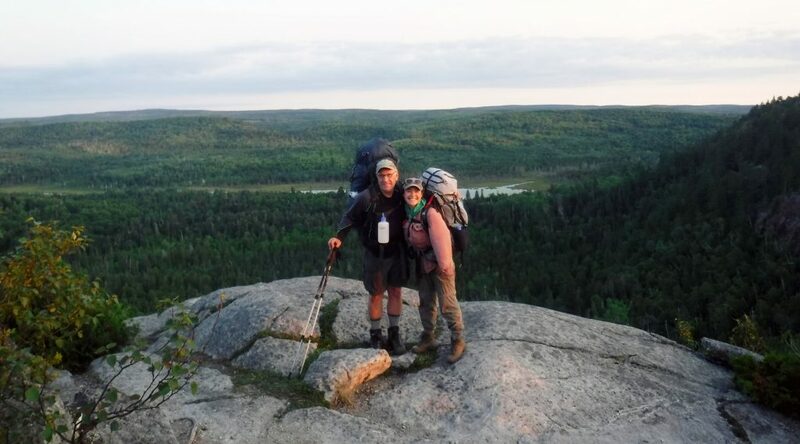 Emily: For me, I find it challenging to let go of control when students are on what we call “final expedition.” Final is when students take the lead and own their wilderness travel. Our educational model relies on learning through natural consequences and experience; we give students the opportunity to fail. It’s hard to let go and watch students make decisions that are not always in their best interest. It can be tough to go along for the ride when students decide to go to bed late before a big travel day or when they try to cook and eat dinner during “bug hour,” but you have to let the process itself be the lesson. What surprises you in your work? Mark: I’m surprised by how easy and natural it was for me to leave my corporate career and return to a life as an Outward Bound instructor. Once I’m in the field, there is something instinctual, energizing and immediately rewarding about an expedition. Nothing is more satisfying than witnessing and being a part of the tremendous teamwork that is a critical component of each trip. Many corporations would love to develop such cooperation and camaraderie in their workforce. Emily: I’m still surprised by how much Outward Bound impacts me personally. Instructors often joke about getting “Outward Bounded” alongside students. We too can be pushed to our limits of compassion and patience. We take care of students and we take care of our colleagues too. I’m not a mom, but I’m guessing my role on course is similar. We call our co-workers and our student crews our “wilderness family.” I’ve learned so much about myself — my blind spots, my strengths. The feedback I receive from colleagues is amazing and very personal. We give each other a lot of support, but also the space to learn and grow into the people we want to be. Who Benefits From Outward Bound? Mark: Throughout my OB career, past and present, I have met people of all ages, from various walks of life. I’ve worked with high school students (both underserved and privileged), corporate folks, vets coping with PTSD, kids coping with Dyslexia or Fetal Alcohol Syndrome, young adults in transition and college students. For all of these students, taking an OB course allowed them to gain some perspective, identify strengths and grow into a chosen path. I’d recommend Outward Bound to anyone interested in adventure and personal growth. Emily: I agree with Mark! Outward Bound is definitely for everyone. This season, I worked with grieving teens, boys coping with adversity, young male leaders of color and first generation Minnesotans. I really enjoy working with people from different backgrounds and learning about their experiences and challenges. We all have way more in common than we think. OB provides a space to form community and share personal stories safely. Students are extraordinarily resilient and the wilderness is a wonderful place to remember or discover your strengths. I hear you had an amazing time instructing the TFI course together this summer. Can you tell us a bit about that experience? Mark: I really love the TFI students. They are unspoiled, polite, playful, cooperative and anxious to learn. These young men already knew each other, and after they got to know us and trust us, they welcomed Emily and me into their “brotherhood.” Honestly, we all became a family, more so than on any other course I’ve experienced. I firmly believe that communicating with the students in Spanish, which Emily was fluent in, had a lot to do with their comfort level and how well this group came together. There was a lot of laughter and fun on this course, and I was more than willing to make a complete fool out of myself when it was appropriate. Emily: Yes, I loved speaking Spanish in the woods! I don’t get to do that too often. The wilderness can feel like a pretty white space sometimes. Traditional education systems don’t always create a ton of space for the expression of a diversity of language, tradition, and culture. We get to create spaces for expression on our wilderness courses, and to do that with TFI students was empowering. Together, we created a special relationship of respect and curiosity. Part of that was witnessing a Perseid meteor shower! It was a clear night and we stayed up after evening meeting to look at the sky. The stars just kept getting brighter and around 11:00 p.m. we began to see shooting stars. Then we all gasped! There was one really big star with a bright red tail! 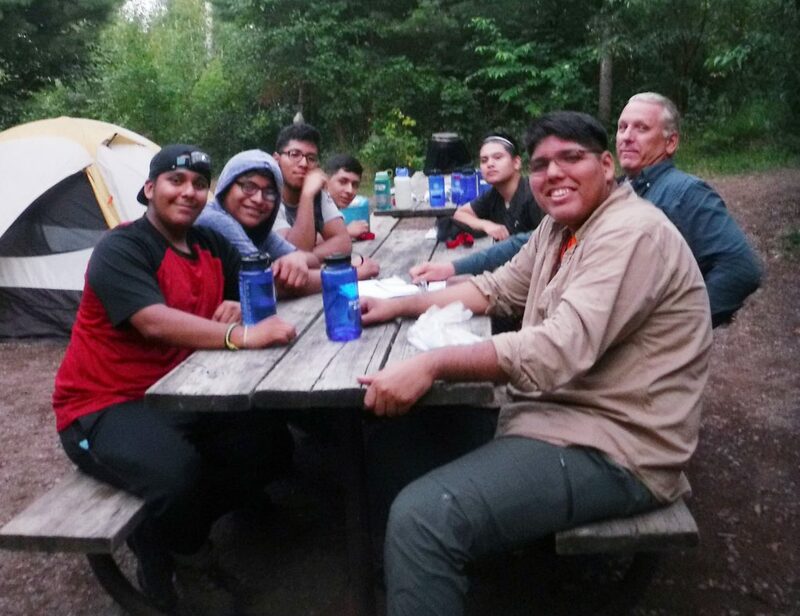 It was amazing to share that moment and, for some of these guys, it was their very first time in true wilderness. “Brotherhood” is a meaningful word at TFI. How did this play out on course? Brotherhood developed powerfully as trust, empathy and vulnerability increased. Students reached a point where they could honestly give and receive constructive feedback. The guys supported each other on tough days and through hard miles on the trail. Each day, a different person was appointed Secret Service Agent. That Agent would do simple things to lift the spirits of peers who might be struggling. He might offer to shoulder the weight of a backpack for a while, fill a water bottle or tell a joke. Emily: We had a powerful conversation about masculinity around the fire one night. This was already a theme for the group. I really enjoyed being able to dig deep and hear them share personal experiences, definitions and viewpoints. I invited them to push beyond thinking about what it means to be “a good man.” I asked them to think about what it means to be a good person. As Mark will tell you, what happened was inspiring. In the conversation that followed, they spoke with amazing awareness, honesty and compassion. They really did the hard work and blew away some gender stereotypes. I think brotherhood is being able to listen to different perspectives, with respect, even when there is disagreement. Being out in the woods with your own little community brings out the best in us when it comes to interacting with others. Any surprises on the trail? Mark: These young men are really polite at mealtime. In my experience, 16-year-old boys can behave like starved animals, especially when they are really hungry. I thought it was pretty special that all of our meals were unrushed and pleasant. Nobody pestered the cooks, even when they were starving. We were also really impressed by their compassion toward us. Students don’t usually ask how you are doing or wonder when you are going to get a break. As the students were getting ready for their solo, they wanted to know if we were going to get a break too; they were worried we were working too hard! Emily: These students have a natural tendency to support one another. This is usually something that we facilitate and teach, but these guys already had a service mindset. When we introduced peer leadership as a concept, they were very ready to adopt the idea that we are only as strong as our weakest link. They really responded to the idea that people have different needs and strengths and they were willing to readjust the group dynamics and goals to take care of each other. It’s a real honor to see this in action and a great reminder of what our communities can look like when we lead with compassion. You’ve both mentioned “community” and “family.” How did your expedition crew function like a family? Mark: Well, to begin with, our tents were our homes. Students shared a tent with their peers, like a family sharing a house. Each evening in camp, you also set up a kitchen by the fire, a bathroom out in the woods and a place to wash up. Students have daily roles and responsibilities: Leader of the Day, Cook, Navigator, Camp Engineer, etc. We created a group living agreement in our Brotherhood Journal with a list of values that we agreed to abide by on course, and back at home after the expedition. Emily also read us all a “bedtime story” every night after evening meeting and helped everyone unwind before falling asleep. Emily: Mark and I started with mutual respect for each other on this course, kind of like parents. We both felt we had a lot to learn from each other and we worked as a team. Our skills complement one another too. Mark’s immense technical skills and experience are a nice contrast to my interest in educational method and practice. It takes a village to raise a child! As wilderness parents to these guys, we took care of them, and we took care of each other. 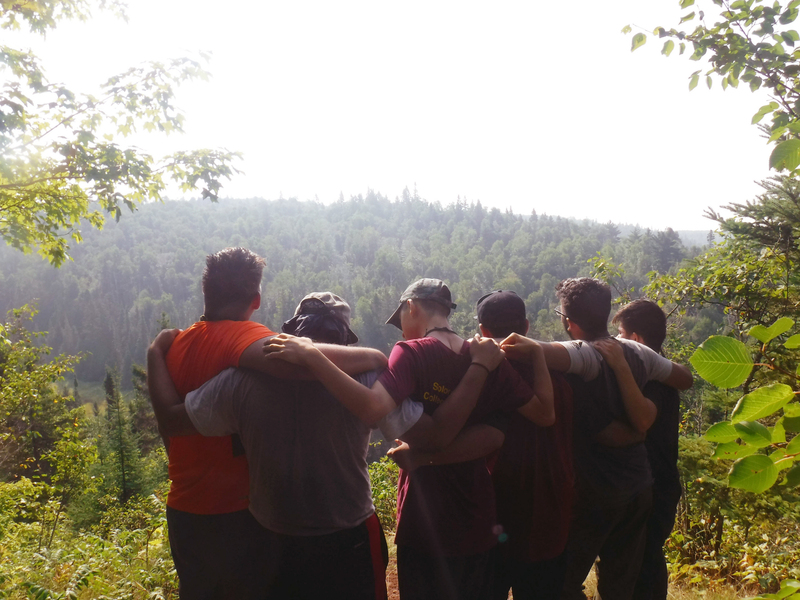 Role modeling a healthy relationship with your co-instructor is a powerful learning tool for Outward Bound students. During your course debrief, you both highlighted something pretty special that happened in your TFI community one night. Mark: One evening, after an exhausting day, I was purifying water. Emily was leading a group discussion about family by the fire. At one point, Emily asked if I’d like to add anything to the discussion, so I walked over and joined in. I’m not sure what came over me at that moment, but I’ve lost both parents, two brothers and one sister. All of a sudden, I found it difficult to speak and I became emotional. Just when I thought I had composed myself and began to speak, I started crying. I was trying to explain that family should never be taken for granted. Then each of those young men gathered around me and silently put their hands on my shoulder while I continued to speak. I can honestly say, with great gratitude and sincerity, that this felt like the same comfort I once received from my deceased family. The family and community support offered up by these strong young men gives me hope for the future. Emily: I think it’s really powerful to be human with one another — to support each other, to be compassionate, to forgive, to have fun, to joke around, to be honest — that’s powerful. When we share more about ourselves and get to know each other, we can better understand one another’s experiences and ourselves. As two white people of inherent privilege, Mark and I worked to create an open and safe space for the students, who all share a Latino background. We wanted to share experience without judgement. While we don’t all come from the same place, together, we worked to make a space to feel heard and recognized for accomplishments and struggles. If you had to pick a favorite memory from course? Emily: We realized we’d done our jobs. Mark: As we started to head out I remembered that one of the guys had slipped me a note. I pulled it out of my pocket and we read it together. Emily: It was amazing, really personal. All we could do was hug each other and cry. The Fellowship Initiative builds brotherhood and a “second family” through a program that takes students through three full years of leadership development — the adventure of a lifetime! 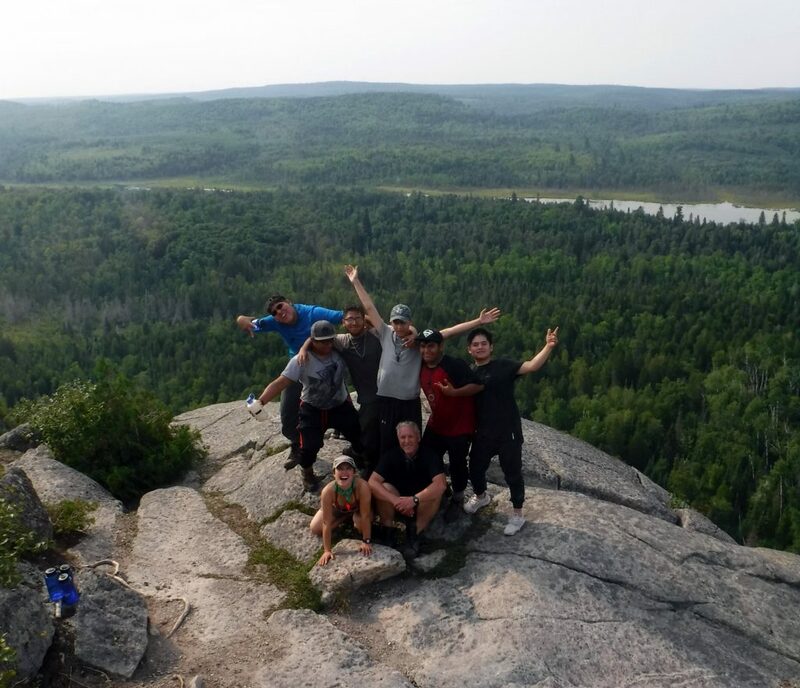 Emily, Mark and the entire Voyageur Outward Bound team are thrilled to be part of the TFI family and this innovative journey to success.